The stock was locked in the upper circuit limit of 20% on the BSE after the company posted a strong 50 per cent growth in sales numbers for December 2018. Shares of Atul Auto hit an upper circuit limit of 20 per cent at Rs 348 apiece on the BSE on Tuesday after the company posted a strong 50 per cent growth in sales numbers for December 2018. 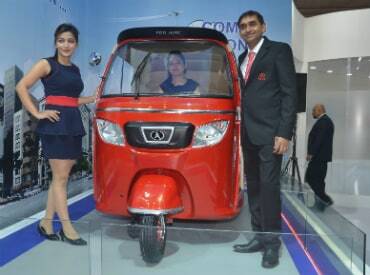 The three- wheeler manufacturer sold 4,332 units in December against 2,890 units in the same month last year. The company’s total vehicle sales during December quarter grew 39 per cent at 13,808 units, as compared to 9,922 units sold in the previous year quarter. Total sales for the period April to December was up 21.4 per cent at 37,767 units against 31,120 units. Atul Auto in its investor meet said the growth drivers in near term are network expansion - deeper penetration in the domestic market, exploring overseas market, introduction of e-vehicles in the potential domestic market and developing various applications and upgrading the existing product portfolio. The company had reported a muted 1.7 per cent year-on-year (YoY) growth in net profit at Rs 25 crore during the first half of (April-September) of the financial year 2018-19. Total operational income grew 8 per cent YoY to Rs 314 crore during the period. "With GST having been successfully implemented, trade conditions have stabilised and we are witnessing a gradual improvement in demand. With announcement of budgetary allocation of Rs.14.34 lakh crore in the rural area for fiscal year 2018-19, the demand from rural sector will probably go up. We expect government spending plans such as increases to Minimum Support Price (MSP), provision of health insurance, etc. to bolster rural development and drive consumption," Atul Auto said in 2018 annual report. In the calendar year 2018, the stock had underperformed the market by falling 37 per cent as compared to a 6 per cent rise in the S&P BSE Sensex.